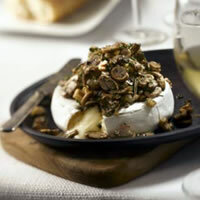 In this inspired appetizer, the sharp flavor of brie is enhanced with a savory topping of mushrooms, rosemary, thyme, and crunchy walnuts. At serving time slice the wheel of Brie in half horizontally and place cut side up on oven -proof serving plate or baking pan. Spoon the topping evenly on cut surfaces of Brie. Bake in 350° F oven for about 8-10 minutes or until cheese is beginning to melt. Sprinkle parsley or chives on top to garnish if desired. Serve with thinly sliced whole wheat baguette or plain crackers. Cooking Tip: To barbecue, place cheese on presoaked cedar plank and barbecue, covered over medium -high heat for 8-10 minutes.